One of the best treats of summer (and one of my most favoritest types of fruit) is the white peach. When perfectly ripe, it's fragrant - sweet, happy and almost innocent. Yes things can smell innocent :) It's lighter than a yellow peach in hue and taste... delicate, even. And then it gives just the slightest bit to your touch. It has firm flesh but it bursts with juice when you bite into it. I would write a love poem to this fruit. Have I ever mentioned that sometimes I break into random haiku? Anyways. 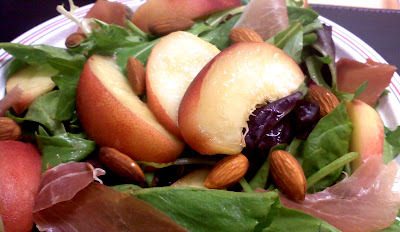 I usually happily consume white peaches as they are as a midday snack - either sliced or I bite into it like an apple. But today I made a meal of it. I took a hint from those popuar proscuitto wrapped melon slice recipes -- the sweet and salty flavor combination is always a winner. I added the almonds for some crunch and cuz apparently they're really great for you, too. It's a very simple salad that I happily dug into for a light lunch. It's way nutritious, too, bonus! Toss all the ingredients together and eat! I should note, by the way, that I don't usually have dressing with salads. I like to make sure every bite has peach in it so its sweet juices coat everything - it's its own dressing! However for you dressing lovers out there, a balsamic vinaigrette would complement this quite well.